The impact of environmental noise on health and well-being is well documented in the literature. ,, WHO has summarized the scientific evidence on the harmful impacts of noise on health and made recommendations on guideline values to protect public health. According to the recent report by WHO on estimated burden of disease of environmental noise,  one in three individuals in Europe is annoyed during the daytime and one in five has disturbed sleep at night because of traffic noise. Epidemiological evidence indicates, furthermore, that those chronically exposed to high levels of environmental noise have an increased risk of cardiovascular diseases such as myocardial infarction. Internationally accepted exposure-response relationships based on meta-analyzes of a large number of international studies show that railway noise is estimated to cause less annoyance than road traffic (and aircraft) noise at the same noise level. , However, findings in recent years from Japanese studies by Morihara et al. and Korean studies by Lim et al. show, unlike most European studies, that railway noise is perceived as more annoying than road traffic noise at sound levels above L Aeq,24h 55 dB (see also review by Öhrström and Skånberg). This applies particularly to the Japanese Shinkansen express trains, but also to conventional trains. Several of the Japanese studies have been done in areas with a very large number of trains (about 500 - 800 trains/24h). The very intense railway traffic may thus contribute to the high proportion annoyed by railway noise in Japan compared to European countries. In Sweden, the main railway lines have on average 150 - 200 trains/24h and at the railway lines in the three largest city areas, there are at most about 150 - 500 trains/24h, while other railway lines have much fewer trains. The number of trains in the Swedish study on railway and road traffic noise in Lerum municipality  was quite high, 196/24h, but there are no studies in Sweden on the effect of a very large number of trains in terms of general noise annoyance and other health effects of railway noise. The present study aims to investigate the effects of railway noise in an area with the most intensive railway traffic in Sweden. Railway traffic may, in addition to noise, also cause problems with ground-borne vibrations, especially in areas where the ground consists of clay. In Sweden, about 141 km railway lines with approximately 6, 560 dwellings are estimated to be exposed to ground-borne vibrations induced by trains that exceed 0.35 mm/s and about 920 dwellings with a vibration velocity that exceeds 1.4 mm/s inside the dwelling. The policy by The Swedish Transport Administration and the Swedish Environmental Protection Agency  is a level of at most 0.4 mm/s as a long term goal for vibrations in dwellings. Vibrations velocities of 0.5 mm/s are "clearly noticeable" and velocities above 1.2 - 1.5 mm/s are by most people characterized as "strongly noticeable." Vibration has been reported to cause a number of different effects such as fear of damage to the house, that they make things move or furniture / household items rattle, as well as sleep disturbances. A recent literature review by Öhrström and Skånberg  shows that there is little knowledge on the health effects of railway vibrations alone or vibrations in combination with railway noise. The results obtained from field studies ,,, point, however, in the same direction, i.e. that railway noise annoyance is considerably higher in areas simultaneously exposed to vibrations. Railway transport, both passenger and freight transport, is increasing, and new railway lines are planned for environmental reasons. The combination of more frequent railway traffic and faster and heavier trains will, most probably, lead to more disturbances in the near future. To effectively plan for mitigations against noise and vibration from railway traffic, new studies are urgently needed to obtain a better basis of knowledge on the adverse effects of combined effects of railway noise and vibration. The research project "TVANE" (Train Vibration and Noise Effects) conducted between 2006 - 2011 investigates in a series of empirical field studies and laboratory experiments how human responses (health and well-being including annoyance and sleep disturbances) are affected by (a) railway traffic and road traffic noise per se, (b) combined exposure to railway noise and vibrations, and (c) intense railway traffic (see www.tvane.se). The main objectives of the present study as part of the TVANE project were to obtain new knowledge from empirical field studies on how the relationship between noise levels from railway traffic and general annoyance is influenced by (1) the number of trains and (2) the presence of ground-borne vibrations from railway traffic. Another aim (3) was to study the impact of building situational factors, such as orientation of balcony / patio and orientation of bedroom window, on general annoyance to railway noise. For the present study, two study sites (Töreboda and Falköping) were selected in areas with relatively intense railway traffic and no vibrations from railway traffic. These two sites will, henceforth, be called "Area 1.0" Another two study sites (Alingsås and Kungsbacka) were selected in areas with approximately the same number of trains as in Area 1 but where the trains induced strong vibrations in the ground and the dwellings (henceforth "Area 2.") The three study sites (Töreboda, Falköping, and Alingsås) are situated at the railway line "Västra Stambanan" between Gothenburg and Stockholm, and the fourth study site (Kungsbacka) is situated at the railway line "Västkustbanan" south of Gothenburg. A fifth study site (Sollentuna) was selected in an area that is exposed to the most intense railway traffic in Sweden (henceforth "Area 3.") This study site is situated at the railway line "Ostkustbanan" north of Stockholm. [Table 1] lists the distribution of train types running on the railway lines in the three study areas. The number of trains/24h on the two parallel tracks in Area 1 was 124: 78 passenger trains (a majority is commuter and high speed trains) and 46 freight trains (40 of them during evening and night). The number of trains/24h in Area 2 was higher (206 in site Alingsås and 179 in site Kungsbacka) than in Area 1 due to local traffic with commuter trains between Alingsås-Gothenburg-Kungsbacka (105 and 146, respectively). This type of train has a much lower sound level and is considered as the least annoying type of train. The number of freight trains in Area 2 was 48 and 22 for Alingsås and Kungsbacka, respectively (a majority of the freight trains passes during evening and night). In Area 3, the number of trains/24h on the four parallel tracks was 481. Most of them are passenger trains (446), which includes commuter trains (155), electrical locomotives with passenger cars (103), and high speed trains (188), the main part of the latter (166) travel round trip to Arlanda Airport with a speed of about 200 km/h. Fifteen trains are freight trains, of which 12 run during evening and night. Preliminary calculations of noise and measurements for control of noise and vibration levels were performed before the final selection of study areas. A GIS-based method was used to determine the noise levels. Calculations of noise levels at the most exposed side were provided for each residential building using the standardized model Nordic Prediction Method  and the calculation program Cadna. All calculation points were determined at 2 and at 4 meters above the ground as free field values. Sound levels were calculated as L Aeq,24h , L Aeq day, evening, and night, and as L AFmax and L den . The results in the present study are based on data in the L Aeq,24h range from 41-65 dB, but are presented in relation to both L Aeq,24h and L den as determined 2 meters above ground. [Table 2] provides the statistics for sound levels and distance to the railway line for the three study areas. As can be seen in [Table 2], the difference in mean value between L den and L Aeq is smaller in Area 3 (4.6 dB versus ca. 7.3 dB in Area 1 and Area 2, respectively) since only 12 freight trains are passing during evening and night in Area 3. The Swedish Transport Administration use a weighted vibration velocity expressed in mm/s indoors as the main vibration indicator. The Swedish measurement method  uses the same frequency weighting and overall approach as the Norwegian method,  but the absolute maximum measured vibration velocity is recorded instead of the 95 percentile. All three vibration directions are measured on the floor indoors, and the maximum level of all directions with a 1 s exponential time weighting (known as SLOW weighting for acoustic signals) is taken as the measured value. In the measurement campaign performed within the TVANE project, which results are used here, the ground vibration in a point close to the building was also measured but only in the vertical direction. Finally, a reference point close to the track was measured also in the vertical direction. For more details on the measurement method and results, see technical report from the TVANE project. See also the Table in Appendix, which shows the conversion of weighted vibration velocity expressed as mm/s to unweighted acceleration in m/ s 2 . In the study sites of Area 2 (Vibrations), a total of 16 measurements were performed, 6 in Kungsbacka and 10 in Alingsås. All measurements were done at least over one night, which is when most of the freight traffic occurs, and the distance from the track varied from 25 to 300 meters. The ground vibrations followed a rather simple pattern where the measured vibration velocity declined by approximately 47% for each doubling of distance from the railway. The indoor level is strongly dependent on the details of the building. In Kungsbacka, all houses in the investigated area were of similar size and construction, and the ratio of indoor to ground vibration velocity was close to 1, meaning that the vibration strength was similar in the ground as in the building itself. 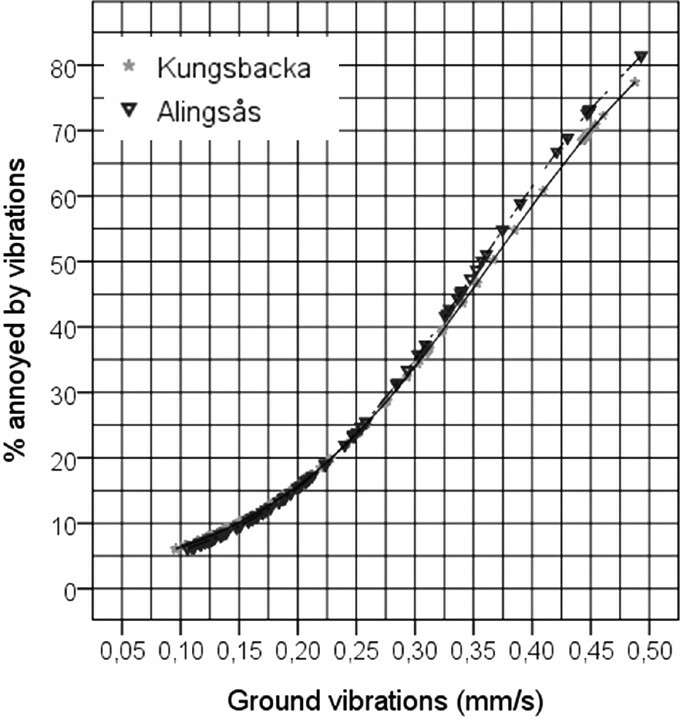 In Alingsås, the building type varied a lot more, and the ratio of indoor to outdoor vibration varied from 0.7 (building vibrates less than ground) to 5.3 (building vibrates much more than ground). The dominating frequency component of the indoor vibration was typically between 4 and 12 Hz. Since it was unfeasible to measure at all locations in were the questionnaires were distributed, a simple prediction method was used based on the measurement results from the same site. At a distance of 100 m from the track, the predicted maximum ground vibration velocity was 0.6 for Alingsås and 0.4 for Kungsbacka. At other distances, the vibration velocity can be determined by scaling with 47% for each doubling of distance. Since the vibration velocity was similar indoors and in the ground in Kungsbacka, it was possible to predict an indoor level for this site, but that was not possible for Alingsås. A few samples were also taken at the areas where little or no vibrations were expected, and the results verify that the vibration levels were indeed lower, about three to ten times lower in the ground. Although no indoor measurements were performed, the dominating frequencies were also higher, around 50 Hz, which makes the indoor levels at least ten times lower than in the areas sensitive to vibrations. [Table 3] shows the study periods and the number of participants in 5 dB sound exposure categories in L Aeq,24h for the three study areas. The study comprised in total 1695 participants, and the overall response rate was 53%. In the three study areas, the mean age of the respondents ranged between 48 and 52 years. Somewhat more men than women participated in Area 2 (56%); however, the reverse was the case in Area 1 and Area 3 (54% and 56% were women, respectively). A smaller proportion of the respondents in Area 1 (59%) were married or de facto co-habiting than in the two other areas (76% and 74%). A majority of the respondents in the three areas were employed or had their own company (range 64-71 %), and the rest had different status such as studying, retirement (early retirement, sickness- or old-age pensioner), unemployed, or were on sick- or parental leave. In Area 3, a larger proportion (49%) had a high level of education (≥ 3 years at university) than in the other areas (11% and 29%). The average time of residence was somewhat shorter in Area 1 (10.2 years) than in Areas 2 and 3 (16.1 and 15.1, respectively). More respondents in Area 2 and 3 (74% and 73 %, respectively) lived in detached houses than in Area 1 (50%). Sensitivity to sound / noise was reported by least respondents in Area 1 (20%), whereas in Areas 2 and 3, the proportion was higher (about 30%). Except for sensitivity to sound / noise, none of the above-mentioned demographic factors together with the building situational factors (what year the house was built and triple-glazed or two-glazed windows/other) were associated with noise annoyance in any of the study areas. Annoyance and other health effects were evaluated using a questionnaire. The format is based on questionnaires previously used in larger epidemiological studies of noise annoyance in Sweden , and included 50 questions in total. The questionnaire was sent by mail to selected persons (all persons aged 18 to 75 years) together with an introductory letter in April 2007 (Area 1), November 2007 (Area 2), and in April 2008 (Area 3), which presented the survey as a study on the environment, human health, and well-being. Two reminder letters were sent out with 10-day intervals to those who did not respond to the questionnaire. The first reminder consisted only of a letter while the other consisted of the reminder letter and a new questionnaire. In the presentation of the results on noise and vibration annoyance, the "annoyed" category (%A) consists of those who were "moderately," "very," or "extremely" annoyed on the category scales, and the "highly annoyed" category (%HA) consists of those who were "very" or "extremely" annoyed on the category scales. Binary logistic regression analyzes was used to estimate the relationship between noise annoyance and the level of railway noise exposure (L Aeq,24h , L den ) and between railway-induced vibration annoyance and vibration velocity (mm/s). The Spearman's Rank Order correlation test (rS ) was used to determine the relationship between categorical variables and between categorical and continuous variables. Differences in proportions for categorical variables were determined with the Chi-square test (χ2 ). All tests were two-tailed, and a P-value below 0.05 was chosen as the threshold for considering a given relationship significant. Statistical analyzes were conducted with SPSS Statistics 18. The relation between sound levels in L Aeq,24h and L den from railway traffic and general noise annoyance (%A and %HA) was analyzed with binary logistic regression, see [Figure 1] and [Figure 2], respectively. Separate analyzes were done for each of the three study areas. For Area 1 (No vibrations), the odds of being annoyed (%A) by railway noise increased by 18% (OR = 1.18, 95% CI = 1.10 - 1.25), for Area 2 (Vibrations) by 19% (OR = 1.19, 95 % CI = 1.14 - 1.25), and for Area 3 (Many trains) by 21% (OR = 1.21, 95 % CI = 1.16 - 1.26) per 1 dB increase of the sound level. The estimated percent annoyed (%A) in relation to L Aeq,24h is very similar in Area 2 (Vibrations) and Area 3 (Many trains). 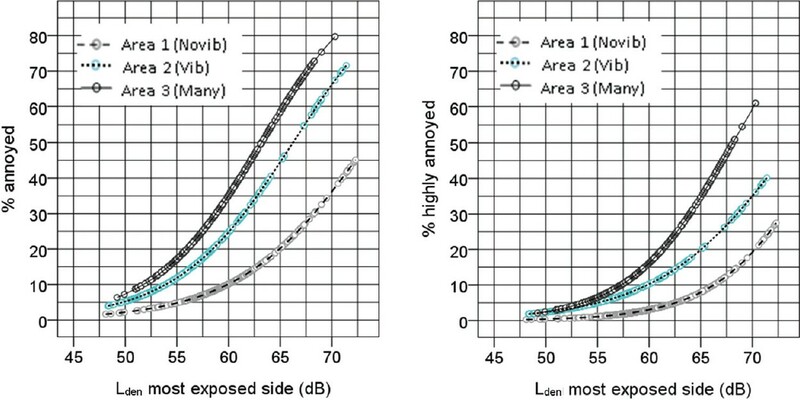 The estimated %A is much lower in Area 1 (No vibrations) than in Area 2 and Area 3, and the difference in noise annoyance between Area 1 and the two other areas increases with increased sound levels from 4% annoyed at 45 dB to 30% at 65 dB [[Figure 1], left]. A similar proportion noise annoyed (e.g. 35%A) is reached at about 5-7 dB lower noise level in areas with a very large number of trains or in areas where the railway traffic causes strong ground-borne vibrations (e.g. at ca 55 dB in Area 2 and 3 and at ca 62 dB in Area 1). The estimated percent highly annoyed (%HA) in relation to L Aeq,24h [[Figure 1], right]) is consistently lower in Area 1 than in the other two areas, and the difference increases with higher sound levels. As opposed to %A, which is approximately the same in Area 2 and 3, the estimated %HA is about 16% units higher at the highest sound levels in Area 3 than in Area 2. Building situational factors, such as type of house, type of windows, and what year the house was built, had no significant impact on railway noise annoyance in any of the study areas (data not shown, see final report from the TVANE project). General annoyance is strongly related to specific disturbances of activities such as communication and sleep, and the correlation is considerably higher than between general annoyance and noise level (e.g. Spearman΄s r s = 0.63 between general annoyance and disturbance of communication and r s = 0.39 between general annoyance and L Aeq,24h in Area 3). Therefore, access to quieter outdoor places that allows for uninterrupted communication and opening of windows at night may reduce noise-disturbed communication and sleep and general annoyance as well. Two of the situational factors investigated in this project, which turned out to be of great importance for general noise annoyance, were the orientation of balcony / patio and bedroom window. Twelve and 14% respectively in Area 1 and Area 2 and 30% in Area 3 had a balcony / patio that faced the railway. Thirteen, 14%, and 17% respectively in Area 1, Area 2, and Area 3 had bedroom windows facing the railway. None of the respondents had balcony / patio or bedroom windows that faced a large road or highway. We analyzed the relation between sound levels in L Aeq,24h from railway traffic at the most exposed side of the dwelling and %A with binary logistic regression and took into account the influence of the orientation of balcony / patio and bedroom window (towards railway or towards another location, i.e. courtyard, small road), see [Table 4] and [Table 5], respectively. Separate analyzes were done for each of the three study areas. Having balcony / patio oriented towards the railway increased the odds of being noise annoyed (%A) in all three study areas (Area 1, OR = 2.46, 95% CI = 1.21-2.0; Area 2, OR = 4.57, 95% CI = 2.34 - 8.92; and Area 3, OR = 2.88, 95% CI = 1.98 - 4.21). The percent noise annoyed is significantly higher if balcony / patio is oriented towards the railway than towards another location [Table 4]. At the Swedish guideline value L Aeq,24h 55 dB, twice as many in all three areas are noise annoyed if the balcony / patio is oriented toward the railway (see column three in [Table 4]). The difference in annoyance between the two situations (balcony / patio facing the railway or not) increases at higher sound levels. Having bedroom window oriented towards the railway increased the odds of being noise annoyed in Area 2 and 3 (Area 2, OR = 2.19, 95% CI = 1.11 - 4.31; and Area 3, OR = 1.93, 95% CI = 1.25 - 2.99), but to a somewhat less extent than orientation of balcony / patio. Orientation of bedroom window had, however, no significant effect on general noise annoyance in Area 1 (OR = 1.62, 95% CI = 0.79 - 3.31). As can be seen in [Table 5], the proportion noise annoyed (%A) is significantly higher if bedroom window is oriented towards the railway than in another direction (towards courtyard, small road). At the Swedish guideline value L Aeq,24h 55 dB, about one and a half time as many in all three areas are noise annoyed if the bedroom window is oriented towards the railway (see column three in [Table 5]). The difference in annoyance between the two situations (bedroom window facing the railway or not) increases at higher sound levels up to about 60 dB and then remains constant. The Swedish Transport Administration has, according to their action program against railway noise, provided all bedroom windows with sound insulation if the sound level from railway noise inside bedrooms exceeds L AFmax 55 dB with windows closed. Thus, the indoor noise level in bedrooms located towards the railway might be lower at the highest sound level categories. The relation between annoyance (%A) due to railway-induced vibrations and ground vibration velocity (mm/s) was analyzed by binary logistic regression for the two study sites Kungsbacka and Alingsås in Area 2. [Figure 3] shows the results in vibration annoyance for vibration velocity up to 0.50 mm/s since higher vibration velocity was present only in one of the two sites. There is a strong relationship between vibration annoyance and vibration velocity. At 0.10 mm/s, 5% are annoyed by railway-induced vibrations, and the majority (80 %) is annoyed at the strongest vibration velocities at 0.50 mm/s. The building situational factors, other than geological characteristics, that are of great importance for the perception of railway vibrations, is type of house; the proportion of vibration-annoyed people was significantly higher in detached houses than in blocks of flats. Other investigated factors (e.g. cellar or not, wood or brick in the building structure) were not associated with vibration annoyance. All houses in the study site Kungsbacka were detached houses while 50% of the houses in the study site Alingsås were blocks of flats. [Figure 4] shows %A and %HA by railway-induced vibrations in relation to vibration velocity in the ground for respondents living in detached houses in Kungsbacka and Alingsås. The results are presented in relation to categories with different vibration velocity since few respondents lived in dwellings that had a vibration velocity higher than 0.49 mm/s. The Figure shows that %A by railway- induced vibrations (left figure) increases with increased vibration velocity from 10%A at 0.10 - 0.19 mm/s to 36%A at 0.30 - 0.39 mm/s. At vibration velocities above 0.40 mm/s, the proportion annoyed by vibrations is 65%. The %HA by train vibrations [[Figure 4], right] is small at vibration velocities below 0.40 mm/s (2 - 14 %HA). There is a steep threshold around 0.40 mm/s, and about half of the respondents are highly annoyed if the vibration velocity exceeds 0.40 mm/s. Calculation of vibration velocity inside the houses was only possible at the Kungsbacka site where the houses were of a similar type. Since the vibration velocity in the ground and vibration velocity inside the houses were almost identical at this site, we obtained similar dose-relationships between annoyance and vibration velocity indoors (data for Kungsbacka is not shown here) as those relationships between annoyance and ground vibration presented in [Figure 4]. To study possible interaction effects of combined exposure to noise and vibrations from railway traffic, the study material from Area 1 and Area 2 was divided into different groups based on vibration velocity in mm/s in the ground (no vibrations = Area 1 filled squares; 0.10 - 0.39 mm/s = open squares; and 0.40 - 1.50 mm/s = filled circles) and based on noise exposure categories in L Aeq,24h (45 - 50 dB = filled squares; 51 - 55 dB = open squares; and 56 - 65 dB = filled circles). Due to the small variation in vibration velocity, there are very few respondents in some of the groups [Figure 5]. The percentage annoyed by railway noise [[Figure 5], left] varies with vibration velocity and is lowest for the group not exposed to vibrations. The group exposed to the strongest vibrations (0.40 - 1.50 mm/s) is the most noise annoyed, except at 56 - 65 dB. Due to very few individuals in some of the groups, statistical tests could only be performed in some cases. Thus, at 51 - 55 dB, there was a significant increase in noise annoyance with increased vibration velocity (χ2 , P < 0.001) from 9% (no vibrations) to 22% for those having vibrations between 0.10 - 0.39 mm/s and 32% for the group with strongest vibrations (0.40 - 1.50 mm/s). The percentage annoyed by railway vibrations [[Figure 5], right] varies with noise levels and is lowest for the group with the lowest noise levels (45 - 50 dB) and highest for the group with the highest noise levels (56 - 65 dB). The group living in the area with no vibrations is not included in the analysis. Differences in vibration annoyance between groups with different noise levels could be statistically tested for the group with weakest vibrations (0.10 - 0.39 mm/s). Vibration annoyance increased significantly with higher noise levels from 16% annoyed at the lowest noise levels (45 - 50 dB) to 28% in the group with 51 - 55 dB and 50% in the group with highest noise levels (P = 0.001). As the railway traffic is very intense and the quiet time periods are substantially reduced, railway traffic seems to generate similar general noise annoyance as road traffic, depending on exposure metric and degree of annoyance. , This result is, to some extent, in agreement with results from studies by Morihara et al. conducted in areas with a very large number of high speed trains in Japan (up to 800 trains/24h or about one train every second minute) and also with previous railway studies in Sweden by Öhrström and Skånberg,  which found that the extent of annoyance increased in proportion to the number of trains per day and night. However, it contradicts findings by Moehler and Greven  in studies performed in Germany from 1996 and onwards. They analyzed the dose-response relationship between railway noise annoyance and L Aeq,24h for three groups of residential areas with different number of trains/24h: 150 - 200 trains; 250 - 300 trains; and 350 - 500 trains/24h and found no differences between the three dose-response curves that indicated a higher increase in noise annoyance with higher number of trains. Furthermore, as opposed to the Japanese studies by Morihara et al., Moehler and Greven  found no differences in noise annoyance between high speed trains with a speed between 200 and 250 km/h and conventional railway traffic in Germany. The increase in noise annoyance (%A) in the presence of railway-induced ground-borne vibrations in this study corresponds to a difference in sound level of about 5 - 7 dB. These results are in line with earlier railway studies in Sweden, ,, which showed that noise annoyance was significantly higher in areas with high vibration velocities corresponding to a difference in sound level of about 10 dB. The data from these previous Swedish railway studies in fifteen sites in six study areas with weak or strong ground-borne vibrations induced by railway traffic were performed between 1990 and 1993 and comprise 2883 or about 1/3 rd of the 8527 data points used in the meta analyzes by Miedema and Oudshoorn 2001. Recently, Fidell et al.,  in their evaluation of the variability in annoyance across studies on aviation noise, used the Swedish railway data set (SWE 365) as an example to illustrate, by using "Community Tolerance Levels" (i.e. a noise level, at which 50% of the respondents are highly annoyed), the influence of non-noise factors on the dose-response relationship between %HA and sound level in DNL (day-night average sound level). They found that respondents in the three low vibration cities were 15 dB (DNL) more tolerant of train noise than respondents in the three high vibration cities. A follow-up study after mitigation of railway-induced vibrations in connection with the construction of new railway tracks in the study site in Kungsbacka, as part of the 1995 year study by Öhrström,  showed an extensive reduction in both noise annoyance and annoyance due to railway-induced vibrations. Residential characteristics, such as position of balcony / patio and bedroom windows in relation to the railway line, had a large influence on general noise annoyance. Disturbance of conversation, according to the literature, e.g. reviews by Moehler 1988,  Öhrström 1990,  and Öhrström and Skånberg 2006,  is closely related to general noise annoyance, and it is one of the most pronounced effects of railway noise. It thus makes sense that noise annoyance in this study was twice as high among those respondents who had their balcony / patio oriented towards the railway compared to those who had not. Having bedroom windows oriented towards the railway line also increased the proportion noise annoyed, but to a somewhat lesser extent than did the position of balcony / patio, which might be explained by the comparatively lesser impact of railway noise on sleep. Those who had bedroom windows facing the railway line were, in general, 1.5 times more noise-annoyed than those who had bedroom windows facing the shielded side. This is in accordance with findings in the previous Swedish studies on railway noise, both in areas with and without vibrations. Of the few studies on road traffic noise and the effects of bedroom location on general annoyance, Pirrera et al. and Öhrström  found significantly higher general noise annoyance and also longer sleep latency if bedroom windows faced the road side as opposed to the backside. Amundsen et al. concluded from their recent façade insulation study that the advantage with respect to indoor noise annoyance of having the bedroom facing the least noise-exposed side of the dwelling corresponded to a 6 dB reduction in noise level. This is roughly equivalent to the benefit of the effect of façade insulation (a reduction of 7 dB) on road traffic noise annoyance. In their study, the difference in noise annoyance between those who had and those who had not bedroom windows facing the main road seemed to decrease with increasing noise exposure outside at the most exposed side of the dwelling. This agrees with results in the present study where the difference in noise annoyance did not increase at noise levels above 60 dB between the ones who had bedroom windows towards the railway and those who had not. We found strong interactive impacts of annoyances due to noise and vibrations. Noise annoyance was higher in groups exposed to strong vibrations, and vibration annoyance was higher in groups with high sound levels. Yokoshima and Tamura  also found significant differences in %HA by noise from Shinkansen railway between three groups with different vibration velocities as well as significant differences in vibration annoyance from the Shinkansen railway between three groups with different noise levels. These authors  also analyzed the combined annoyance to noise and vibrations from the Shinkansen train and concluded that vibrations had a greater impact on combined annoyance than noise at distances within 40 m from the railway line. Both, the number of trains per se and the presence of ground-borne vibrations induced by railway traffic, and not just the noise level, are of relevance for the perceived annoyance of railway noise. For the proportion annoyed to be equal, a 5 - 7 dB lower noise level is needed in areas where the railway traffic causes strong ground-borne vibrations and in areas with a very large number of trains. This has implications for noise and vibration mitigations in the development of future railway infrastructure. To reduce noise annoyance and other adverse effects, effective mitigations against noise are indispensable at railway lines with very intensive traffic. Mitigations against vibration are necessary in areas sensitive to railway-induced ground vibrations to reduce annoyance from both vibration and noise. Further, residential characteristics such as orientation of balcony / patio and orientation of bedroom window have a significant impact on railway noise annoyance. Where possible, these spaces should be located at the backside in relation to the railway line to facilitate communication and relaxation outdoors, as well as restful sleep. 1. Berglund B, Lindvall T, Schwela DH, editors. Guidelines for community noise. Geneva: World Health Organization; 1999. Available from: http://whqlibdoc.who.int/hq/1999/a68672.pdf. [Last accessed on 2011 Nov 24]. 2. Berglund B, Lindvall T, Schwela, DH, Goh KT, editors. Guidelines for community noise. Geneva: World Health Organization Guideline Document; 2000. 3. WHO. Night noise guidelines for Europe. Geneva: World Health Organization; 2009. 4. WHO. Burden of disease from environmental noise - Quantification of healthy life years lost in Europe. World Health Organization; 2010. 5. den Boer LC, Schroten A. Traffic noise reduction in Europe - Health effects, social costs and technical and policy options to reduce road and rail traffic noise. Delft, The Netherlands: CE Delft; 2007. 6. Simonsson B. Uppskattning av antalet exponerade för väg, tåg- och flygtrafikbuller överstigande ekvivalent ljudnivå 55 dBA. ["Estimation of number of exposed to road traffic, railway and aircraft noise exceeding equivalent noise levels of 55 dBA"]. Stockholm, Sweden: WSP Akustik; 2009. 7. Swedish Parliament. Infrastrukturinriktning för framtida transporter, Prop. 1996/97:53. ["Infrastructure Focus for future transportation, Proposition. 1996/97: 53"]. Available from: http://www.riksdagen.se/webbnav/index.aspx?nid=37anddok_id=GK0353. [Last accessed on 2011 Nov 24]. 8. Miedema HM, Oudshoorn C. Annoyance from transportation noise: relationships with exposure metrics DNL and DENL and their confidence intervals. Environ Health Perspect 2001;109:409-16. 9. EU. Position paper on dose response relationships between transportation noise and annoyance. Luxembourg, Office for Official Publications of the European Communities; 2002. 10. Morihara T, Yano T, Sato T. Comparison of dose-response relationships between railway and road traffic noises in Kyushu and Hokkaido, Japan. Proceedings of the 31 st International Congress and Exposition on Noise control Engineering, Inter-Noise 2002. Dearborn, MI, USA; 2002, paper No 241. 11. Lim C, Kim J, Hong J, Lee S. The relationship between railway noise and community annoyance in Korea. J Acoust Soc Am 2006;120:2037-42. 12. Öhrström E, Skånberg A. Litteraturstudie avseende effekter av buller och vibrationer från väg- och tågtrafik. ["Literature review on effects of noise and vibrations from railway and road traffic"]. Report 112. Gothenburg, Sweden: Occupational and Environmental Medicine, University of Gothenburg; 2006. 13. The Swedish Transport Administration. Banverkets årsredovisning 2009. [Annual Report]. Borås, Sweden: Banverket; 2010. [Internet]. Available from: http://publikationswebbutik.vv.se/upload/5948/100243_banverkets_arsredovisning_2009.pdf. [Last accessed on 2011 Nov 24]. 14. Öhrström E, Barregård L, Andersson E, Skånberg A, Svensson H, Ängerheim P. Annoyance due to single and combined exposure from railway and road traffic noise. J Acoust Soc Am 2007;122:2642-52. 15. Pagoldh C. Godstågstrafikens stambanenät. Vibrationsstörningar från järnvägstrafik i Sverige. ["Freight train traffic on main line railways. Vibrations from rail traffic in Sweden"]. Report S-5967-A. Stockholm: Ingemansson Akustik; 1990. 16. The Swedish Transport Administration and the Swedish Environmental Protection Agency. Buller och vibrationer från spårburen linjetrafik. Policy och tillämpning. ["Noise and vibration from railbound traffic. Policy and implementation."]. BVPO 724.001. Borlänge, Sweden: Banverket och Naturvårdsverket; 1997. 17. Göransson C. Vibrationer från tågtrafik - Jämförelse av två mätmetoder och olika riktvärden. Vibrations from railway traffic - Comparison of two methods of measurement and different guideline values. Report 1991:44. Borås, Sweden: SP Sveriges Provnings- och Forskningsinstitut; 1999. 18. Klaeboe R, Turunen-Rise I, Hårvik L, Madhus C. Vibration in dwellings from road and rail traffic - Part II: Exposure effect relationships based on ordinal logit and logistic regression models. Appl Acoust 2003;64:89-109. 19. Yokoshima S, Tamura A. Combined annoyance due to the Shinkansen railway noise and vibration. Proceedings of the 34 th International Congress and Exposition on Noise control Engineering, Inter-Noise 2005. Rio de Janeiro, Brazil; 2005, paper No 1560. 20. Lercher P, Brauchle G, Widmann U. The interaction of landscape and soundscape in the Alpine area of the Tyrol: an annoyance perspective. Proceedings of the 28 th International Congress and Exposition on Noise control Engineering, Inter-Noise '99. Fort Lauderdale, Florida, USA; 1999. p. 1347-50. 21. Öhrström E, Skånberg A. A field survey on effects of exposure to noise and vibration from railway traffic, part I: annoyance and activity effects. J Sound Vib 1996;193:39-47. 22. Öhrström E. Effects of exposure to railway noise - a comparison between areas with and without vibrations. J Sound Vib 1997;205:555-60. 23. European Rail Research Advisory Council (ERRAC). Strategic Rail Research Agenda 2020. Brussels, Belgium: ERRAC; 2007. 24. Ringheim M. Railway traffic noise - Nordic prediction method. Copenhagen, Denmark: Nordic Council of Ministers, Tema Nord; 1996. p. 524. 25. Swedish Standard SS 460 48 61, Vibrationer och stöt - mätning och riktvärden för bedömning av komfort i byggnader. [Vibration and shock - Measurement and guideline for the assessment of comfort in buildings]. Stockholm: Swedish Standards Institute; 1992. 26. Turunen-Rise I, Brekke H, Hårvik H, Madshus C, Klæboe R. Vibration in dwellings from road and rail traffic - Part I: A new Norwegian measurement standard and classification system. Appl Acoust 2003;64:71-87. 27. Ögren M, Jerson T. Mätning av buller och vibrationer från tåg- och vägtrafik inom TVANE-projektet. ["Measurement of noise and vibration from railway and road traffic in the TVANE project"].VTI notat 2-2011. Göteborg, Sweden: VTI; 2011. 28. Öhrström E, Skånberg A, Svensson H, Gidlöf-Gunnarsson A. Effects of road traffic noise and the benefit of access to quietness. J Sound Vib 2006;295:40-59. 29. Technical Specification, Acoustics - Assessment of Noise Annoyance by Means of Social and Socio-Acoustic Surveys, International Standard ISO/TS15666. Geneva, Switzerland: International Organization for Standardization; 2003. 30. Klaeboe R, Öhrström E, Turunen-Riise I, Bendtsen H, Nykänen H. Vibrations in dwellings from road and rail traffic - Part III: Towards a common methodology for socio-vibrational surveys. Appl Acoust 2003;64:111-20. 31. Gidlöf-Gunnarsson A, Öhrström E, Ögren M, Jerson T. Comparative studies on railway and road traffic noise annoyances and the importance of number of trains. Proceedings of the 10 th International Congress on Noise as a Public Health Problem, ICBEN 2011. London, UK; 2011. p. 686-694. 32. Öhrström E, Gidlöf-Gunnarsson A, Ögren M, Jerson T. Resultat och slutsatser från forskningsprogrammet TVANE - Effekter av buller och vibrationer från tåg- och vägtrafik tågbonus, skillnader och samverkan mellan tåg- och vägtrafik. ["Results and conclusions from the research program TVANE - Effects of noise and vibration from railway and road traffic - railway bonus, differences and interactions between railway and road traffic noise."]. Report No 1: 2011. Gothenburg, Sweden: Occupational and Environmental Medicine, University of Gothenburg; 2011. 33. Fields J. Effect of personal and situational variables on noise annoyance in residential areas. J Acoust Soc Am 1993;93:2753-63. 34. Fields JM, Walker JG. Comparing the relationship between noise level and annoyance in different surveys: A railway noise vs. aircraft and road traffic comparison. J Sound Vib 1982;81:51-80. 35. Moehler U, Greven LM. Community response to railway and road traffic noise - a review on German field studies. Proceedings of the 34 th International Congress and Exposition on Noise control Engineering, Inter-Noise 2005. Rio de Janeiro, Brazil; 2005. 36. Öhrström E, Gidlöf-Gunnarsson A, Ögren M, Jerson T. Effects of railway noise and vibration in combination: Field and laboratory studies. Proceedings of Euro Noise 2009. Edinburgh, Scotland; 2009, paper No 270. 37. Stansfeld S, Matheson M. Noise pollution: Non-auditory effects on health. Br Med Bull 2003;68:243-57. 38. Marks LE. The unity of the senses. New York: Academic Press; 1978. 39. Pedersen E. Human response to wind turbine noise. Gothenburg, Sweden: University of Gothenburg, Occupational and Environmental Medicine; 2007 (Doctoral Thesis). 40. Yano T, Morihara T, Sato T. Community response to Shinkansen noise and vibration: A survey in areas along the Sanyo Shinkansen Line. Proceedings of Forum Acusticum 2005. Budapest, Hungary; 2005; p. 1837-41. 41. Yano T, Sato T, Morihara T. Impact of vibration on railway and road traffic noise annoyance. Proceedings of the 35 th International Congress and Exposition on Noise control Engineering, Inter-Noise 2006. Honolulu, Hawaii, USA; 2006, paper No 06-621. 42. Yokoshima S, Yano T, Kawai K, Morinaga M, Ota A. Socio-acoustic survey data archives at INCE/J. Proceedings of the 10 th Congress on Noise as a Public Health Problem, ICBEN 2011. London, UK; 2011. p. 798-805. 43. Öhrström E, Skånberg AB. Effekter av exponering för buller och vibrationer från tågtrafik - undersökningar i 15 tätorter. ["Effects of exposure to noise and vibration from railway traffic - investigations in 15 study sites"]. Report 1/95, 1995. Göteborg, Sweden: Department of Environmental Medicine, University of Gothenburg; 1995. 44. Fidell S, Mestre V, Schomer P, Berry B, Gjestland T, Vallet M, et al. A first-principles model for estimating the prevalence of annoyance with aircraft noise exposure. J Acoust Soc Am 2011;130:791-806. 45. Öhrström E. Community reactions to railway traffic - effects of countermeasures against noise and vibration. Proceedings of the 26 th International Congress and Exposition on Noise control Engineering, Inter Noise ´97. Budapest, Hungary; 1997;2:1065-70. 46. Moehler U. Community response to railway noise: A review of social surveys. J Sound Vib 1988;120:321-32. 47. Öhrström E. Störning från tågbuller - översikt och analys. [Annoyance from railway noise - overview and analysis]. Report 6-90, 1990. Göteborg, Sweden: Department of Environmental Medicine, University of Gothenburg; 1990. 48. Lim C, Kim J, Hong J, Lee S. The relationship between railway noise and community annoyance in Korea. J Acoust Soc Am 2006;120:2037-42. 49. Bangjun Z, Lili S and Guoqing D. The influence of the visibility of the source on the subjective annoyance due to its noise. Applied Acoustics 2003;64:1205-15. 50. Öhrström E, Gidlöf-Gunnarsson A, Ögren M, Jerson T. Comparative field studies on the effects of railway and road traffic noise. Proceedings of the 39 th International Congress and Exhibition on Noise Control Engineering, Noise and sustainability, Inter Noise 2010. Lisbon, Portugal; 2010, paper No 90. 51. Pirrera S, de Valck E, Cluydts R. Nocturnal road traffic noise and sleep: Location of the bedroom as a mediating factor in the subjective evaluation of noise and its impact on sleep. Proceedings of the 10th Congress on Noise as a Public Health Problem, ICBEN 2011. London, UK; 2011. p. 663-7. 52. Öhrström E. Long term effects in terms of psycho-social wellbeing, annoyance and sleep disturbance in areas exposed to high levels of road traffic noise. Proceedings of the 6th International Congress on Noise as a Public Health Problem, Noise and Man '93. Nice, France: Institut National de Recherche sur les Transports et leur Sécurité; 1993;2:209-12. 53. Amundsen AH, Klaeboe R. The Norwegian Facade Insulation Study: The efficacy of facade insulation in reducing noise annoyance due to road traffic. J Acoust Soc Am 2011;129:1381-9. 54. Yokoshima S, Tamura A. Interactive effects between Shinkansen railway noise and vibration on annoyance. Proceedings of the 35 th International Congress and Exposition on Noise control Engineering, Inter-Noise 2006. Honolulu, Hawaii, USA; 2006, paper No 06-621. Sharp, C., Woodcock, J., Sica, G., (...), Moorhouse, A.T., Waddington, D.C.
Tassi, P. and Rohmer, O. and Bonnefond, A. and Margiocchi, F. and Poisson, F. and Schimchowitsch, S.
Smith, M.G., Ögren, M., Waye, K.P.